Following the release of director Stanley Kubrick’s FEAR AND DESIRE (1953), the burgeoning auteur might have been dismayed to find that his first feature-length narrative effort didn’t generate a great deal of forward momentum for his career. While he gained a good deal of new friends in the critic’s circle, his phone wasn’t exactly ringing off the hook with calls from Hollywood. For Kubrick, there was no turning back– he was now committed as a full-time filmmaker, and until he found success in that line of work, he would have to put food on the table with commissioned work instead. Luckily, he found such work fairly quickly in the form of THE SEAFARERS (1953), an industrial film for the Seafarers International Union. Hosted by CBS newscaster Don Hollenbeck , THE SEAFARERS exists as a way to articulate SIU values and ideals while enticing prospective new members. Using an unnamed East Coast headquarters location as a reference point, the short film provides an in-depth look into the seafaring industry from a worker’s perspective. Kubrick’s treatment of the SIU headquarters makes it seem like something of a clubhouse, and considering the fact that the SIU’s members are transient by the nature of their work, the headquarters would essentially need to function as such—a home away from home. The seafaring union and industry as a whole is treated as a very noble entity, committed to the betterment of its members and their families. As an industry film, it’s fairly unremarkable, but it takes on a much more fascinating aura when viewed in the context of Kubrick’s canon. Shot by Kubrick himself, the film is the director’s first to be shot entirely on color 35mm film. Kubrick’s confidence in cinematography comes from his background in black and white photography, but that confidence wavers somewhat in the transition to color. Kubrick understands that the way subjects are lit will change in the switch from black and white to color, but his inexperience in the matter causes the image to suffer. Utilizing a broad, even lighting scheme, Kubrick creates an image that’s a little bit over-exposed, but that also could admittedly be due to the print transfer or the film stock itself. To my eyes, the way that the colors are rendered suggests THE SEAFARERS was shot on cheaper reversal stock instead of negative. Industry films are by their nature very dry and informational, and THE SEAFARERS is no different in its emphasis on the communication of helpful information at the expense of Kubrick’s personal artistic aesthetic. However, one of Kubrick’s favorite camera moves—the slow, long dolly shot—pops up during the cafeteria segment and gives us a clue as to the identity of the wizard behind the curtain. THE SEAFARERS is also short on Kubrick’s thematic fascinations as an artist, but there are glimpses into the young director’s developing psyche for those determined to wring meaning from insignificance. For instance, those wanting to see how Kubrick’s exploration of technology (and mankind’s relationship to it) is depicted in THE SEAFARERS could look to the brief section on how the SIU incorporates machines into their daily operation. Likewise, one could point to the close-up of a poster in the barbershop featuring a pin-up girl’s breasts as evidence of Kubrick’s fascination with complicated sexual mores. However, this is probably reading way too much into things. 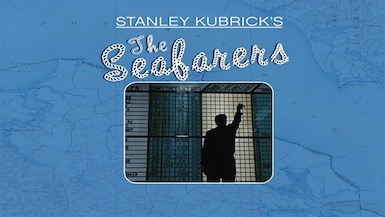 THE SEAFARERS is, ultimately, a minor curiosity in Kubrick’s body of work– notable mainly because of its color photography seven years prior to his first major color work, SPARTACUS (1960), as well as its status as the master filmmaker’s very last short-form work. In terms of the director’s development, THE SEAFARERS doesn’t give us much to go off of, but from a historical standpoint, the film serves as an interesting artifact of a bygone, romantic and idealized era. THE SEAFARERS is currently available on high definition Blu Ray as a supplement to Kino Lorber and the Library of Congress’ release of FEAR AND DESIRE.